In late 2009 I’d finally caught, up with the best novel, in my opinion, author Don Winslow had written to that point, The Power of the Dog. An epic that centered upon three decades worth of corruption, violence, and blood-soaked criminality behind Richard Nixon’s “War on Drugs.” Using a historian’s perspective, along with documented past events, it was clear to me the novel was simply the most excellent historical fiction of the decade. Upon reflection, his readers could pick up echoes of that book in subsequent published material. The Winter of Frankie Machine, The Dawn Patrol, and The Gentlemen’s Hour certainly stayed on this side of the border, but the unseen gravity of the 2005 novel could still be felt. No doubt, the subject once again lit bright with 2010’s Savages, which had its New Wave protagonists dealing with the Baja cartel wishing to expand its market using their designer weed. In fact, Mr. Winslow detailed a portion of Savages with real-life events of what occurred to the Mexican drug coalitions after Dog‘s determined DEA agent had finally wrangled its fictional drug kingpin into custody at the turn of the century1. Though much blood had already been spilt, it all headed into a new phase amongst the drug traffickers vying for power throughout Mexico. Even giving rise to “Los Zetas”, the violently powerful syndicate bringing more terror to the trade. Be it weed, cocaine, heroin, meth, and everything else Big Pharma doesn’t already have its mitts in, U.S. demand is why it exists — don’t let anyone convince you otherwise. Hence, the reason…along with his readers’ cravings…Don Winslow had to continue what he’d chronicled so well. Via familiar and new antagonists, much like the trade itself, his new novel, The Cartel, delves ever darker. A decade after its forerunner, and daunting as its namesake. “It’s 2004. DEA agent Art Keller has been fighting the war on drugs for thirty years in a blood feud against Adán Barrera, the head of El Federación, the world’s most powerful cartel, and the man who brutally murdered Keller’s partner. Finally putting Barrera away cost Keller dearly—the woman he loves, the beliefs he cherishes, the life he wants to lead. Like its predecessor, the author’s discerning eye onto the United States’ longest and most expensive “war” is a gut-wrenching, sprawling heroic poem disguised as a crime novel; with an ultimate irony. The more money and effort we throw at what we perceive as “the problem”, the supply side — care of Mexico and Columbia — has only helped grow it into a global multi-billion dollar industry. Its products today only cheaper and more plentiful; the harm that much more widespread, too. Don Winslow picked up the story of his ying-yang tandem and brought the coin of Keller and Barrera into the new millennium without skipping a beat. Updating the mechanisms of law-enforcement and its crime counterparts with the 21st century’s high-tech and intelligence tools, along with a frightening escalation of violence, social media, and broadening into the realm of terror. Particularly for the people who share a two-thousand border with the United States. Where The Power of the Dog featured its diverse characters on both North and South American continents, across three decades, The Cartel focuses its cast mainly on one. Mexico. Specifically during the last ten years of our, and Mexico’s, “War on Drugs.” An unprecedented period of blood-letting and mayhem that is difficult to fathom. Especially on this side of the border, but which Winslow addresses with a steely compassion and a need to make others understand its true costs. Beyond the trillion we’ve already spent in the failed undertaking. The scope and influence of its forebear quite a challenge for the new novel going in. Carrying on the narrative, let alone supplanting it. What with today’s readership somewhat ground down with copious drug cartel story-lines fed them by thriller writers in the years since The Power of the Dog. Yet, Mr. Winslow did just that with The Cartel, and in that way of his. Once more crafting an unvarnished look at the various battles, shifting alliances in an open-ended conflict with superlative writing. Weaving a impactful tale from the American southwest, through to the killing streets and fields of Juarez and Guatemalan jungle. Bringing the front lines of a dirty war up close, the dead and decapitated bystanders, the professionals on both sides constantly countering each other, strewn about. Journalists trying to report it all (and who the book is dedicated to), disappearing and dying, sometimes horribly, as a result. Bloodshed, torture, and death related through Winslow’s now well-defined prose. In other words, a difficult novel to get out of your head once you’ve read it. The great ones usually are. Easily, the best and most haunting of journeys. A culmination of a saga that in real life sees no light at the end of the tunnel, but is unforgettable nevertheless. The novel matches the author’s previous work in brilliance, yet makes it that much more personal — even if we’d imagine it couldn’t. The Juarista journalist’s final words on the subject in The Cartel still has me reeling with its truth. I daresay 2015 has seen its best historical fiction land, and likely this decade’s, as well. 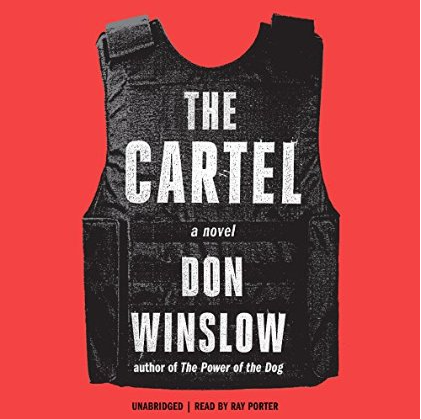 As a listener who remains a big fan of Don Winslow’s work on audiobook, I had been worried the audio publisher wouldn’t have the stellar narrator Ray Porter back for another turn with Art Keller, Adán Barrera, and characters too many to mention. Having performed brilliantly with The Power of the Dog, and also The Dawn Patrol, Blackstone Audio not only pulled off reacquiring Mr. Porter to conclude the epic, but carried through with an equally worthy production. Few readers articulate Don Winslow’s verve and distinguishable wordplay like Ray Porter. It’s just a match made in heaven, even when the two describe a hellish landscape such as the one in The Cartel2. It says something when a hefty work such as this, the novel’s 600+ pages translated into twenty-three and half hours of vocal rendering, and listeners breeze through it. Not wanting it to end. Well, you do yearn to reach its startling climax, but then again, you don’t. Had expected similar this time around, but not what was achieved with this effort. The voice artist’s work exceeded his previous best…and remarkably so. His Spanish pronunciation that much better this time around. Given Winslow’s Cartel dialogue heavily weighted by its Mexican locations and characters, he’d have been hard-pressed not to. Handling the various personas with enunciated nuance and distinct differentiation, it is simply an extraordinary and heartrending narration. Like the novel, the audiobook a must-listen. Michael, I have never even heard of the series, so I appreciate your assessment of it. Thank you, Cindy. Don Winslow is among my favorite authors. This, easily, among his best. Great review! I really can’t wait to read this one. The Power of the Dog remains a favorite of mine (and I just loaned it to a co-worker). I was thinking of trying to see it when the fest hits Dunedin. Same here. Yes, The Power of the Dog is also the one novel of his I’ve pointed others to. This one now joins that recommendation. Wow, utterly fabulous book review Robert! Don’t know it nor the author, but was still enthralled with the quality of your assessment and insights! I echo Cindy’s point. Thank you! Oooh I just listened to an interview w/ Mr Winslow on MPR last week. Sounds like a REALLY gripping book, art imitates life & vice versa in regards to El Chapo. I reviewed a documentary last week about drug cartels, it’s called Cartel Land, that’s worth a watch too Michael. It really is a great work by Don Winslow. Did you recently see that Ridley Scott is supposedly onboard to adapt it for the screen? Yes, Rachel first clued me in the doc CARTEL LAND last week. I hope to catch it soon as it’s currently playing at a couple of theaters here in L.A. I knew it’d be ripe for a film adaptation but um, I kind of lost faith in Ridley Scott. I’d rather see Michael Mann adapting it. Yeah, I think something like this would really be in Michael Mann’s wheelhouse.